Scania are a major player in the world wide commercial vehicles market with an impressive history dating back over a century. With a large rental and demonstration market to be serviced, Scania had already invested in creating a consistent vehicle handover experience.  Scania approached us to overhaul their existing paper based systems and bring it into the digital fast lane. Following an initial kick off meeting, we took the existing paperwork and a using a simple feedback loop we were quickly able to quickly define some "user-first" wireframes. Primarily this app would need to work on the user’s iPad however a centralised web based system was also specified to allow Scania to control user access and manage data. The functionality broke down into two major processes with each terminated by a signature sign off on behalf of both parties. We then designed a considered UI using a design system that was defined by the web brand guidelines and also sympathetically designed for the end device. Signposting the steps involved and ensuring that the user alway knew where they were within the app was an important conscious decision. Taking a user from a clipboard and biro with physical and visible edges, to a boundless tablet could easily make the user feel uneasy. Added to this the requirement for touch areas to be large enough for fingers to access easily transform a paper based A4 into a multiple screen workflow. Scania provided us with some great brand guidelines including grids, logo types, fonts and typography hierarchy. As with most guidelines we were afforded some felxiblity for the digital elements of this project and we worked hard to achieve a seamless integration between the existing brand guidelines and the design elements required by the app. 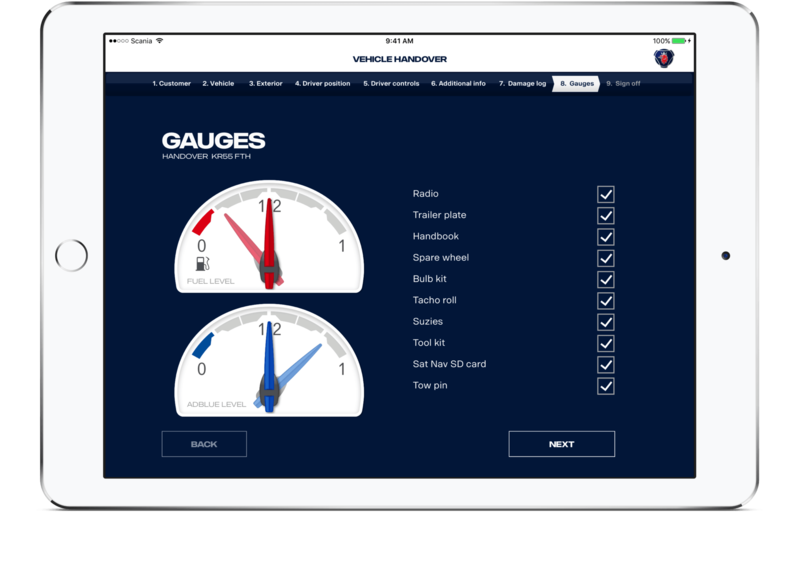 A searchable web based admin area was developed to allow Scania to update checklists in the app and see an audit trail of all vehicles loaned out. Handover documentation with damage log images and customer signatures was readily accessible and stored in one central location. 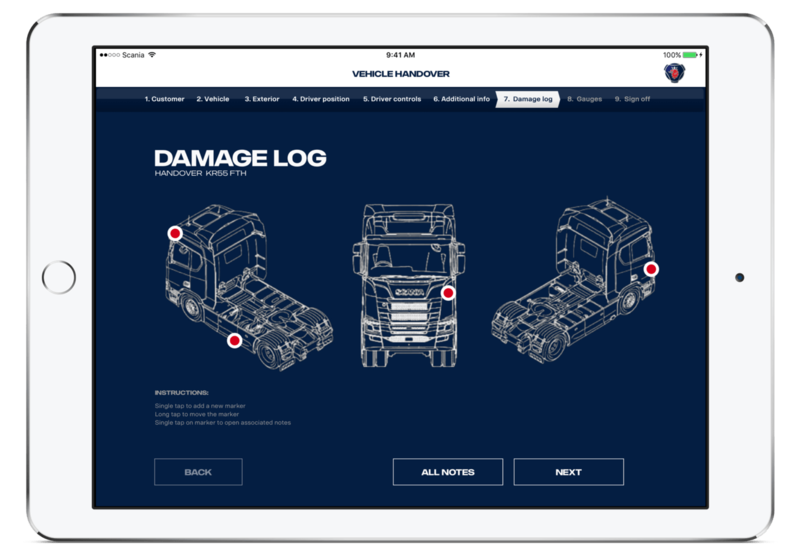 Following the successful rapid turnaround of this project, we were asked to develop Scania's second-hand marketplace app which has since gone on to achieve great results. The app system has reduced the requirement to store paper copies, scan and email customers. It has also increased the quality and user experience for the end user - ensuring a unified and consistent handover.